FRANCE: Although France is yet to install its first offshore turbine, the government has identified four zones for floating wind energy pilot projects and is hoping these will help turn the country into a leader of this nascent technology. France's first offshore wind turbines, on fixed foundations, will not start turning until 2018 at the earliest. However, the country is pushing ahead with plans for floating wind projects, hoping to become a world leader in this emerging — and promising — market. Apart from the desire to create local jobs, the main driver is simply that France has little space for fixed-foundation turbines. The seabed falls away quickly off the coast, especially in the wind-rich Mediterranean, where the industry has identified potential for 3GW of floating capacity. The west coast could yield another 3GW. To kick-start the industry, French energy and environment minister Segolene Royal is expected to launch a call this summer for pilot projects of wind turbines operating on floating foundations. Regional authorities have identified four potential zones, one off the Atlantic coast of Brittany and three in the Mediterranean (see table, below). The winners will be revealed in mid-2016, with installation expected in 2018-19. Each will receive a share of the government's €150 million funding and a tariff, the rate of which has not yet been announced. The aim of the pilot projects is to allow validation of the technological choices and their economic feasibility before proceeding to commercial rollout. France will probably be fielding at least four home-grown contenders, alongside foreign entrants such as US-based Principle Power's WindFloat and Glosten Associates' PelaStar and, possibly, Norwegian company Statoil's Hywind. While WindFloat and Hywind prototypes are already being tested offshore, none of the French designs have yet set foot in the water. First off the French starting blocks should be the Floatgen demonstrator, featuring Ideol's ring-shaped "damping pool" floater, which is slated for installation at the Le Croisic test site off the west coast at St-Nazaire, in early 2016. The anchors will be installed and Bouygues will construct the platform this year. Gamesa is still officially tipped to supply the 2MW turbine, but since establishing the Adwen offshore joint venture with Areva, the Spanish firm now says it is "considering every option", without giving further details. Ideol's compact, concrete floater - only 55 metres across for even the biggest turbines - is the cheapest on the market, claims Bruno Geschier, the company's chief sales and marketing officer. It is compatible with all existing standard offshore turbines, can be built at almost any port and, with a draught of 7-8 metres, can be assembled at the quayside and towed to the site by widely available tugs. Maintenance costs are also low, in part, because the concrete floater generally only needs annual visual inspections, Geschier explains. Ideol has already signed a commercial contract with Japan's Hitachi Zosen (Hitz) to design, engineer and construct floating turbines for the Japanese market. The firm has started tank tests on two demonstration floaters, one steel and one concrete, and is aiming for offshore installation in 2017. Next in the water after Ideol, should be Nenuphar's Vertiwind vertical-axis wind turbine (VAWT), although the start-up faces the added complication of developing a new turbine as well as the floating platform. Nevertheless, an offshore prototype is slated for the Mediterranean's Mistral test site late 2016. Following tests on the prototype onshore, the design has evolved yet again, from a three-bladed turbine on a semi-submersible platform to a less costly, two-bladed machine on a floater which is "not exactly a spar", says CEO Charles Smadja, declining to reveal further details. The "spar" allows the turbine to tilt slightly, thus increasing its productivity, he explains. Given the floater's greater draught, however, the assembly strategy will have to change. The turbine and floater will now be towed separately to the site, where they can be assembled without a crane, Smadja says. The turbine is currently rated at around 2.6MW, but Nenuphar is also working on a 5-8MW machine. Naval architect DCNS is developing a semi-submersible platform in partnership with Alstom, which will supply a slightly adapted version of its direct-drive Haliade 6MW turbine. They are working on integrating the two, especially the turbine's control mechanisms, in order to optimise productivity and limit the forces on the structure, says Wilfried Bourdon, in charge of the project at DCNS. Although the original design envisages a steel floater, DCNS is also considering concrete and a mix of concrete and steel in order to find the most competitive and efficient solution, and one that can be manufactured at most ports. The floater will be between 40 and 60 metres wide and have an unballasted draught of just five metres, meaning that assembly and maintenance can be done at the quayside. But it is not until the end of 2017 that the detailed design phase should be completed, and the first prototype manufactured in early 2018, Bourdon says. It is expected to be installed at the Le Groix test site, which DCNS is developing in partnership with the Brittany regional authorities. DCNS has been gathering data at the site since 2014, to feed into the design of Sea Reed. Spinfloat is another vertical-axis wind turbine, this time on a braceless semi-submersible floating platform, being developed by French wind-power specialist Eolfi. Vertical-axis turbines require less stability than conventional wind turbines, which allows lighter, less costly platforms and moorings, explains CEO Alain Delsupexhe. Again, the shallow draught — 7.5 metres, without ballast — means Spinfloat can be assembled in many ports and towed out to sea by tugs. Eolfi is working on the best option for incorporating pitched blades on the 6MW-rated machine to control rotational speed in extreme winds and optimise aerodynamic performance. It aims to complete the design in 2018 and build a full-size demonstrator in 2019. At the same time, Eolfi is developing five projects totalling up to 3GW in the Mediterranean and has identified 2GW in the Strait of Taiwan, where it will apply for licences this year, says Delsupexhe. Key to all these designs is finding the best compromise between the stability of the floater and its cost. How many actually make it into the water, and then proceed to commercial production, remains to be seen. Meanwhile, everyone is on their starting blocks waiting the promised French call for pilot farms. A report published in June by the UK Carbon Trust finds that floating wind projects could deliver energy for as low as £85/MWh (€119/MWh) by 2050, if the market reaches commercial scale and technology advances are consolidated. 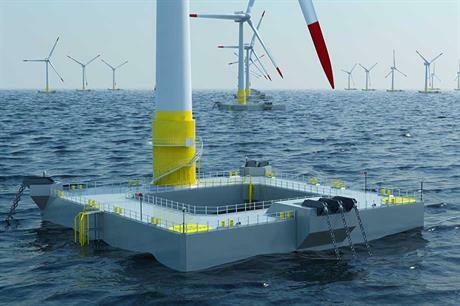 The Floating Offshore Wind Market and Technology Review gathered data from 18 floating design concepts being developed to provide a comprehensive assessment of the technology. It found potential to bring down the levelised cost of energy to £85-£95/MWh, at a capital expenditure of £2.4 million/MW. Current Capex of prototypes is £5.2 million/MW. Semi-submersible platforms, with simple installations, can achieve the lowest potential cost, slightly less than spar-buoy and tension-leg platform designs. The biggest cost savings through technology is expected to come from the platform (16%), the turbine (12%) and balance of plant (9%), the report states. But the critical areas for technological development are in reducing the size and weight of the platform, followed by improving installation procedures and portside operations and maintenance, the report found. The greatest market barrier to this cost reduction is the perception that floating wind is a costly and immature technology, according to the report. A lack of long-term political support and poor understanding in the industry of potential cost savings were also highlighted. The review was commissioned by the Scottish government because near-shore floating wind projects may prove to be a cheaper option in the future for Scotland than far-shore fixed foundation sites. If the UK is to reach 20-55GW in offshore wind installations by 2050, in a drive to increase renewables in the UK energy mix and cut carbon emissions, it will need to consider sites either deeper than 40 metres or further from shore than 30 kilometres, the report said. Scotland has many deep water nearshore sites well suited for wind energy development. With high winds and the potential to use some of the existing facilities available from the oil and gas sector, such as ports and supply chain providers, there are also opportunities for Scotland to take a lead in commercialising floating foundations, it said. Scottish energy minister Fergus Ewing said: "This report will help as we look to reduce costs of floating wind technology and increase the opportunity for Scotland to take the lead in commercialising this technology." To date, there is one Scottish commercial offshore wind project, the 180MW Robin Rigg site to the south-west of the country, and a pipeline of 5GW of consented projects, all with fixed foundations.